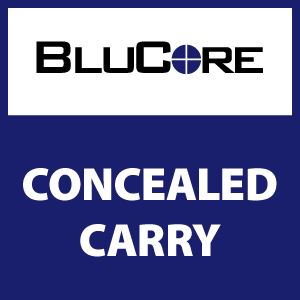 The BluCore Concealed Carry class was designed for people looking to obtain their Colorado Concealed Carry permit, or for current permit holders looking for a dedicated concealed carry class. In this class, we discuss firearms safety, basic fundamentals, concealed handgun selection, and a variety of carry methods and correlating draw techniques for each method. We then move to our range for live fire practice. Upon completion, students will receive a certificate that can be used to apply for a Colorado Handgun Permit (CHP). This course DOES meet the training requirement to obtain a Colorado CCW permit. Requirements: Previous firearms experience is recommended. Fundamental pistol training, such as our Pistol I class is HIGHLY recommended. Students that have a handgun and holster that they are considering using for concealed carry should bring them to the class to train with, as well as at least 50 rounds of ammunition. For those students who do not have a pistol, we have rentals available on a limited basis.